Every year in 50 countries across the world, more than 5 million mothers and children die from preventable conditions and their economies lose billions of dollars to poor health and nutrition. The need to achieve the Sustainable Development Goal to end preventable maternal, newborn and child deaths by 2030 is urgent. We have just 12 years to finish the job and we know what needs to be done. We must fill a significant financing gap so that women’s, children’s, and adolescents’ health and nutrition is prioritized and funded. 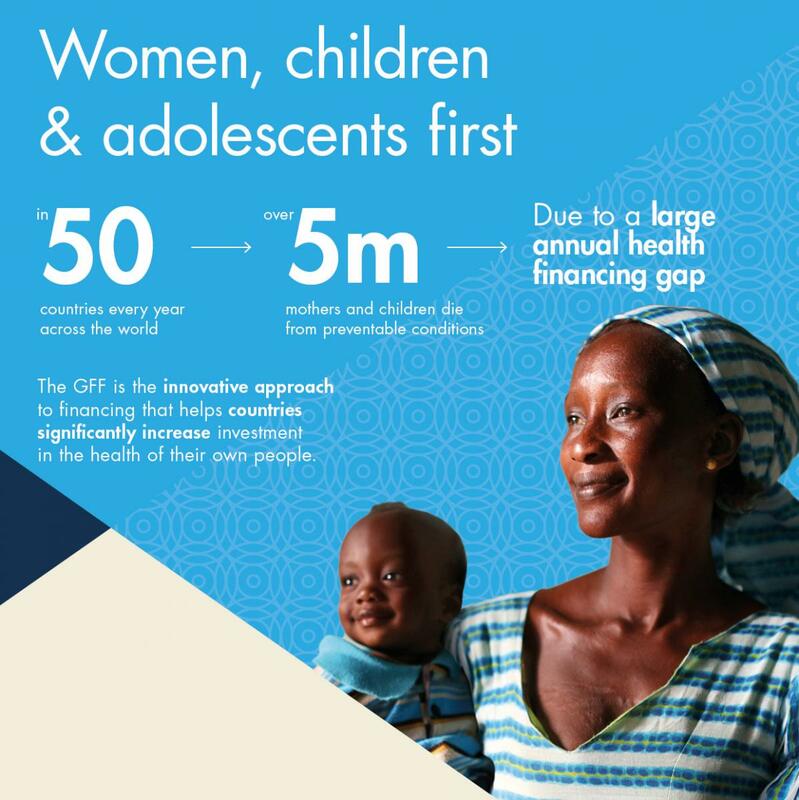 The Global Financing Facility for Women, Children and Adolescents (GFF) is helping governments in low- and lower-middle income countries transform how they prioritize and finance the health and nutrition of their people. This will contribute to saving up to 35 million lives by 2030, and greatly improve people’s and countries’ abilities to thrive in the global economy. The solutions lie with country leadership. With the right backing, governments in low and lower-middle income countries are significantly increasing investment in health and nutrition – transforming the lives of millions and greatly improving their country’s ability to thrive in the global economy. The GFF was launched at the Financing for Development Conference in Addis Ababa in July 2015 as part of a global conversation about how to finance the SDGs, which requires a shift from thinking about billions of dollars to recognizing that we need trillions to achieve the ambitious targets that we have agreed upon. This shift is only possible through new approaches to financing that recognize that countries themselves are the engines of progress and that the role of external assistance is to support countries both to get more results from the existing resources and to increase the total volume of financing. Our job at the GFF is to help countries along the road. We empower governments to bring partners around the table to agree on a clear set of priorities and a country-led plan. Focusing on women, children and adolescents, countries invest in high-impact but historically under-funded areas such as sexual and reproductive health and rights, newborn survival, adolescent health, nutrition – and in the health systems needed to deliver at scale and sustain impact. The GFF Trust Fund acts as a catalyst for financing, with countries using modest GFF Trust Fund grants to significantly increase their domestic resources alongside the World Bank’s IDA and IBRD financing, aligned external financing, and private sector resources. Each relatively small external investment is multiplied by countries’ own commitments – generating a large return on investment, contributing to lives saved and improved. We also support governments to ensure there is a strong system in place to track progress, learn, course-correct and continually improve. This is a powerful and ground-breaking approach that delivers far more than the sum of its parts. It is saving and transforming lives, and in the long-term also enabling countries to progress and flourish, with the right systems and capabilities for a strong, healthier and more prosperous future. The response so far has been profound and demand is high. In November 2018, world leaders pledged US$1 billion to help the GFF partnership on the pathway toward expanding to as many as 50 countries with the greatest health and nutrition needs.. This is an historic opportunity to make progress towards universal health coverage by putting women, children and adolescents first. Together we can finish the job. We can end preventable maternal, newborn and child deaths by 2030, improve the lives of millions of women, children and adolescents, and empower many more countries to build sustainable futures. @ 2017 the world bank group, all rights reserved.